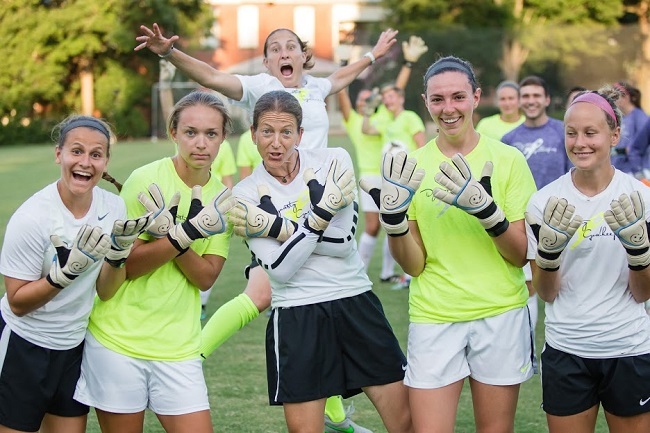 Summer 2016 is long gone by now, but the lingering memories are ones of brilliant saves, goalkeepers pushing against their boundaries and realizing they had more to give, and a staff that truly invested their all for students to get the most out of their week. To understand and fully appreciate what I mean you need to attend a camp or watch a session to truly understand how unique the chemistry is at our camps. This chemistry is inclusive, meaning students PLUS staff. We ALL work hard, and we ALL have FUN in the process. To me that is what this game is about, competing hard to be our best and enjoying the process. It can be seen in the bond I saw form in Week 6 where the entire camp of 12 students piled into one room one evening to come up with fun nicknames for every student AND staff coach. It is the bonds that persist after camp is long over. The excitement in a student’s eyes when they reunite with a friend from a previous camp. And the long term support network of current students, former students, and staff coaches who all look out for each other and support each other in their struggles and successes. There is always someone there to pick you up, to lean on, and to cheer you on. Quite simply what we have at Dynasty is unique and very special to me. You are all my family. Want to see what we are all about? Check out all the KILLER saves and HUGE smiles in the 2016 Photo Album! Dynasty legend and NWSL rookie Britt Eckerstrom of Western New York Flash (now the Carolina Courage for 2017) was named NWSL Player of the Week for Week 8 of the 2016 NWSL season following her side’s 1-0 victory over Alex Morgan and the Orlando Pride on Saturday. The Penn State alum had yet to concede a goal in her professional career when she received the player of the week honor for the first time. The Germantown, MD native made several great saves including a double save that came in the 36th minute. She first dove to deny Orlando Pride’s Maddy Evans and seconds later a rebound sent back post by Pride’s Jasmyne Spencer. Similar to the 2015 NCAA College Cup, the 2016 NWSL Final featured two Dynasty goalkeepers! NWSL veteran gk Kelsey Wys, the starting gk for the Washington Spirit, and Western New York Flash reserve goalkeeper Britt Eckerstrom in her rookie season. In an exciting game that went down to penalty kicks the WNY Flash triumphed 3-2 with the Flash starting gk Sabrina D’Angelo making 3 saves during the pk shootout to propel the Flash to victory and earn the NWSL Championship Game MVP Award. 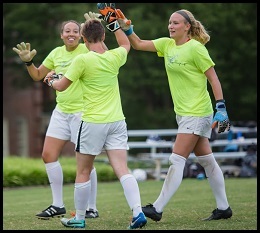 Congratulations to both goalkeepers on successful seasons playing professional women’s soccer here in the U.S.! Following the conclusion of the 2016 NWSL season Kelsey decided to continue playing throughout the NWSL off-season in Australia as many other NWSL players choose to do. It is a great way to stay sharp and get more match experience. She was loaned to the Newcastle Jets of the Australia League that runs November through February. However, unfortunately Wys suffered a torn right ACL shortly after arriving in Australia in a match on November 20th. We wish you a full recovery Kelsey!!! CONGRATULATIONS to Dynasty goalkeeper Rose Chandler being name to the 2016 U20 World Cup which was held in Papua New Guinea in November. Rose has been a part of the youth national team pool since 2014 and has worked hard to maintain her role and consistently figure into key rosters at big events. While the team finished just out of medal contention in 4th place, they fought hard and I know the experience as a whole was valuable for all the players. Starting in all 23 matches, Armstrong played all 2090 minutes in net for the Huskies this season, recording 93 saves for a .823 save percentage and a 0.86 goals against average. Armstrong anchored the back line of the UConn defense and pitched a career-best 11 solo shutouts this season, finishing second in the program record book for all-time career shutouts, with 27.3. Of those 11 shutouts, two came during the conference tournament, where Armstrong shutout USF and SMU to help UConn claim the 2016 American Athletic Conference Championship title, the teams’ second title in three years. Davidson College goalkeeper Alex Carpenter picked up Atlantic 10 Player of the Week honors earning the Defender of the Week, her first career weekly award. A native from Lee’s Summit, MO, the sophomore had a strong week between the pipes in leading Davidson to a 1-1 record. Carpenter finished with 16 saves, a 0.67 goals against average and earned half a shutout in games vs. Marist and Wake Forest. In Thursday’s 6-0 shutout win vs. Marist, Carpenter started the contest and shut out the Red Foxes for the first 45 minutes while recording a pair of saves. 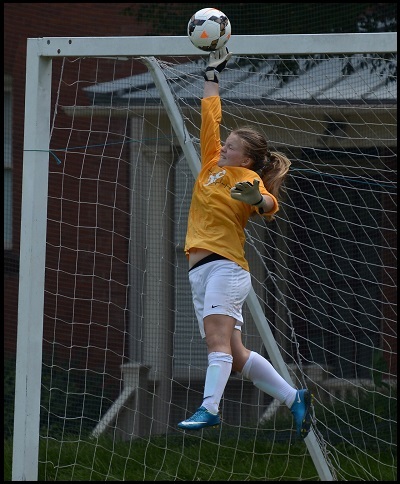 Despite suffering a 1-0 setback Sunday on the road against an unbeaten Wake Forest squad, Carpenter played very well in goal as she helped keep the ‘Cats within striking distance. The sophomore came up with a personal-best 14 saves to push her season total to a team-best 35. Cassalia closed out her career making 93 saves between the posts during her final season. She earned the starting nod in 17 of the Black Knights’ 18 games, logging more than 1,548 minutes of action. In her career, she total 330 saves, while posting 10 shutouts in her 71 games played. She ended her time at West Point third all-time in saves and second in minutes played (6566:49). Dixon helped provide two clean sheets to lift Asheville to back to back Big South triumphs. 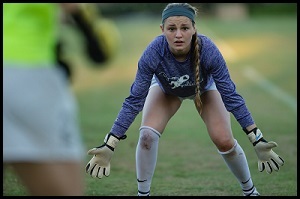 Dixon compiled six saves on 15 shots in the Bulldogs’ victory over Presbyterian College. 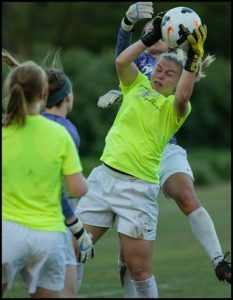 The goalkeeper followed this performance with another 1-0 shutout over High Point, in which she had four saves. Started in goal for the Jayhawks in 17 of 21 matches, amassing 10 wins for the second straight season. Amassed a goals-against average of 0.81, the fourth-lowest single-season GAA in program history. Her .785 save percentage was a career-best. Francis, who will graduate in the spring with a bachelor’s degree in biological sciences and minors in chemistry and economics, boasts an impressive 3.938 grade point average. One of the most prolific goalkeepers in Pitt history, this is the first ACC All-Academic honor for the Cary, N.C., native. Francis has earned Dean’s List and the Athletic Director’s Gold Award in each of her semesters at Pitt, and earned a 4.0 GPA in six different semesters. In her tenure at Pitt, Francis etched her way into the record books in nearly every goalkeeping category, having made the start in 60 consecutive games dating back to her freshman campaign. In order to be considered for the ACC All-Academic Team, student-athletes must have a minimum 3.0 GPA for both the last two semesters and in their academic careers. Both athletic and academic achievements are considered. Enjoyed a fantastic first season at Carolina after starting 21 matches in net. 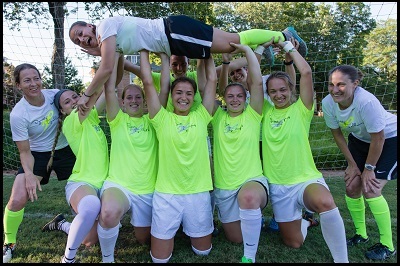 Finished season ranked first in the SEC and eighth in Division I with a program-record 0.43 goals against average. 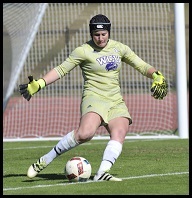 Her 11 shutouts led the league and were good for the ninth-best mark nationally. 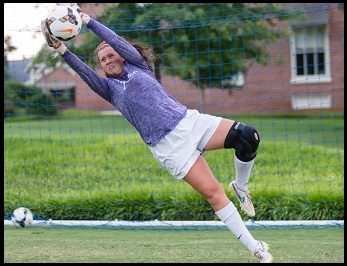 She also topped the conference in save percentage with a mark of 0.868 which ranked 13th among Division I keepers. Her 11 shutouts were the most by a freshman in program history and the third-best total by a Gamecock in one season. Mikayla finished the season with a record of 18-2-1, earning the second-most wins in a year in school history…eight of her 11 clean sheets came in league play, including a shutout against No. 17 Florida (10/16). Krzeczowski conceded just three goals in SEC action and allowed nine goals for the year…logged 59 saves for the season, and her 1,883 minutes in net were a program record for a Gamecock freshman. Martin was strong in goal all season for the Pioneers, playing every single second and compiling a 0.85 goals against average and nine shutouts. Her goals against average was the seventh-best in a single season in program history, while her nine shutouts were the third-most in a season by a Pioneer keeper. Martin had a streak of six straight shutouts from Sept. 21 to Oct. 14, the most consecutive clean sheets by a single goalie in school history. Played in 18 matches, starting in 16 for the Musketeers. Recorded 63 saves for a .741 save percentage, ending her Xavier career with a save percentage of .813 for four years. Played over 1200 minutes in goal, allowing 22 for a GAA of 1.65, for a career GAA of 1.34. Collected a pair of complete shutouts to bring her career total to nine. 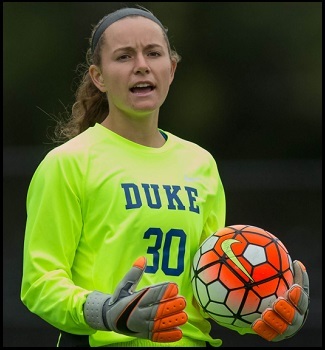 Duke University goalkeeper EJ Proctor, a product of Wilson, N.C., started all 23 matches in goal for the Blue Devils as a junior. 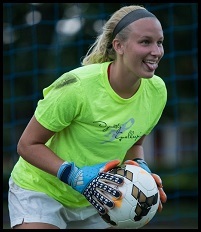 She collected 10 shutouts and a 0.63 goals-against average, which was the second-best ledger in school history. In the ACC stats, Proctor ranked fourth in goals-against average, ninth in saves (59), sixth in save percentage (.797) and tied third in shutouts. A visual and media studies major, Proctor owns 21 career shutouts at Duke and was named to the All-ACC Academic team for the second straight year. 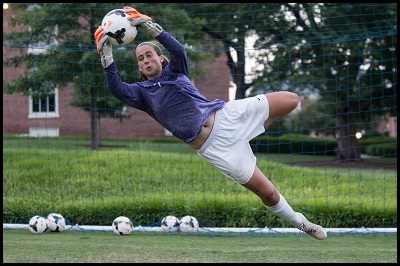 Smith earned CAA Player of the Week after a pair of shutouts in the Tribe’s 2-0 week. In a 1-0 win at VCU on Thursday, Smith recorded a career-high 13 stops, which was just the fourth double-digit save performance since 2001 by a Tribe keeper. Smith matched that with three saves in the 2-0 win at UNC Greensboro on Sunday. Smith faced 29 shots on the week as she and the Tribe defense extending a scoreless streak of 227 minutes of game play dating back to the Virginia Tech match. The Columbia, S.C. native owns a 0.85 goals-against-average with 37 saves, and four shutouts. Played in 19 games and started 18 in goal … Led the team with an 8-11 record giving up 28 goals and recording a 1.48 goals against average – ranking seventh in the SoCon … She had five shutouts in the season including three straight on the Catamounts’ big three-game winning streak … She also had a career-high 13 saves at Charlotte to open the season … Tinstman ended her career at Western Carolina ranked fourth in the WCU record books for most wins (26), saves (232), and overall minutes played (5,880) … She also completed her career ranked third for goalie games played (71), goalie games started (55) and goalie minutes played (5,872). Tullis-Joyce, a redshirt sophomore goalkeeper out of Shoreham, N.Y., set program records with just 16 goals allowed and a 0.84 goals against average in 19 starts this season, receiving multiple player of the week awards. A marine science/biology major with a 3.724 GPA, Tullis-Joyce notched an unblemished 4.0 mark in the fall and has picked up Provost’s Honor Roll distinction three times as a Hurricane. Appeared in and started all 20 games in goal for the Eagles. Registered 81 saves, while facing 227 shots. Boasted a 1.46 goals against average and .723 save percentage, while owning a 6-4-10 record with five clean sheets throughout the season. I am extremely proud to post about the growing list of Dynasty youth goalkeepers who are continuing to feature prominently in our youth National Team pool. 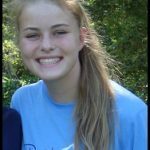 Congratulations to Kat Asman of Roswell, GA on being called back into two more youth U16 US Girl’s National Team (USGNT) events. Kat has been a regular in the USGNT pool for the past 2 years. 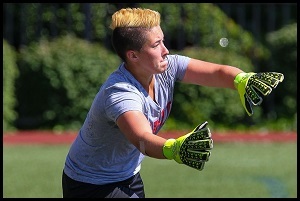 The summer and winter events were two key camps for Kat to continue to showcase her goalkeeping talent at the youth National Team level! Congratulations to senior Emma Hill finishing out a strong high school career for Queen Anne’s High in Maryland. 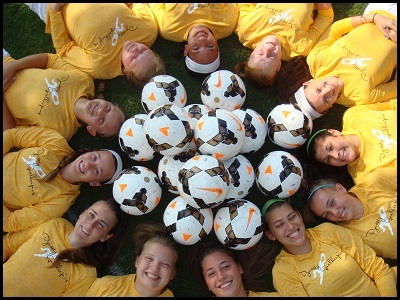 Her team only lost two games during regular season, once to Kent Island (fellow Dynasty goalkeeper Maddie Banks’ high school) and also to Parkside. However, during playoffs it was a different story. They handily beat Kent Island 5-1 and then turned around tie Parkside 2-2 in regulation, advancing on a 4-3 penalty kick shootout after seven kickers. Emma made a key stop during overtime and 3 penalty kick saves to contribute to her team’s big win. 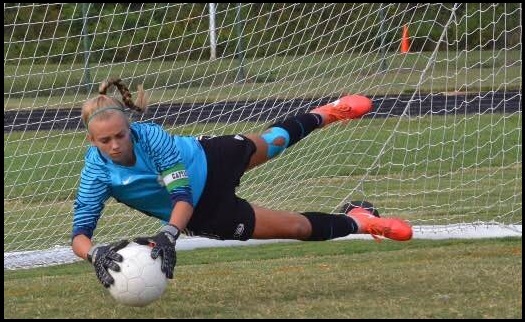 Queen Anne’s HS ended up losing to Fallston High (2015 State Champs), but Emma said she really enjoyed the season making an impact with some big time saves that kept her team alive in the playoff run. For her consistently strong play all fall Emma was named 1st Team All Conference, 2nd Team All State, and was recognized as the Conference Player of the Year in her high school’s conference. Way to go Emma! You can watch highlights from the shootout here! Congratulations to Ruthie Jones of Charlotte, NC on a great year with the U15 USGNT. 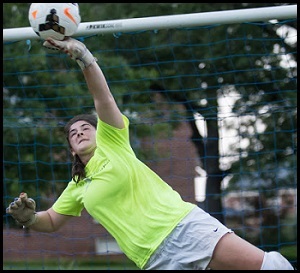 Her biggest achievement was being named as the starting goalkeeper to the U15 US Girls National team to represent the United States at the CONCACAF U15 Girl’s Championship in August. The U.S. won the event and Ruthie was honor for her consistent performance throughout the event by winning the Golden Glove as the top goalkeeper in the event! She is the 2nd Dynasty Goalkeeper to win this honor as Rose Chandler also won this prestigious award at the U20 CONCACAF Championship in 2015. 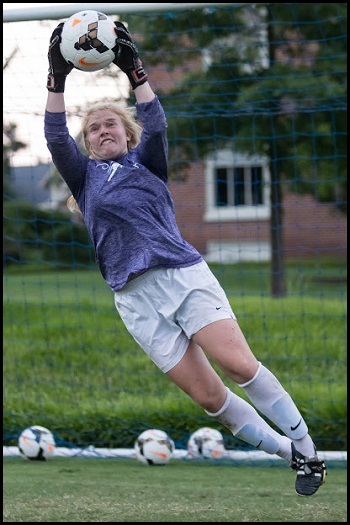 Ruthie not only played a key role with the U15 GNT in August , but she continues to prove herself worthy of invitation back into camp, which given the competitive nature of youth soccer these days and the pressure we put on ourselves as goalkeepers to be perfect can be extremely hard! 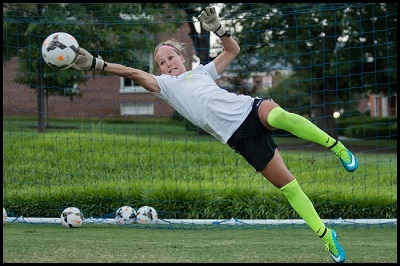 Not only was she called into the final U15 camp of 2016 she was also called into the first ever held Striker and Goalkeeper Camp to be held by US Soccer to focus on shooting, goal scoring and goalkeeping. 23 strikers and only 7 goalkeepers were invited from the 2000, 2001, 2002 age groups, so it certainly is an honor to be included in that group! Way to go Ruthie! Congratulations to Tyler McCamey of Atlanta, GA on her first call up to the U15 USGNT in their final camp on the 2016 year. Congratulations to Ashley Orkus of Birmingham, AL for working her way through a serious knee injury and a LONG road back to the youth National Team Pool! 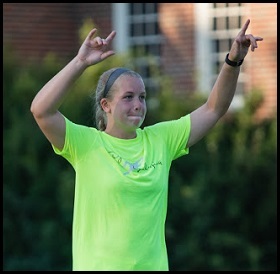 Ashley was last in with the U15 & U17 USGNT in 2013 and will be back in again now with the U18USGNT! Love her sheer grit and determination! Congratulations to Kennedy on being named to the 2001 US Youth Soccer ODP All Star Team from the Thanksgiving Interregional event. 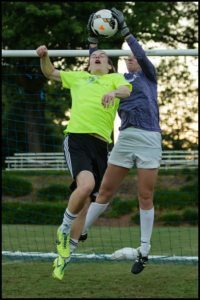 In addition she was named the “Best Goalkeeper” for the 2001 class at the event.